There have been a few interviews with Rocket players written over the past couple of days about how the team has turned the corner on the season, now better able to execute in late-game situations, getting defensive stops, etc. With this kind of talk, you can’t help but think the Rockets were going to take care of business, at least over their next 3 games, by beating teams they should beat, starting with one of the worst offensive teams in the league — the Milwaukee Bucks (lowest in scoring, field goal percentage, and 3-point shooting percentage). After all, they also had 3 days of rest since their Tuesday night victory against the Pistons. I have to admit I was buying into the groupthink. Instead, the Rockets suffered one of their most embarrassing losses of the season Friday night. Not because it was a loss to a mediocre Milwaukee team with a record in of 8-13 in the East, which is a lot worse than the Rockets’ 7-13 in the tougher Western Conference. Well, it’s partly because of it. It’s because as Daryl Morey said on Thursday during a radio interview, the Rockets just about needed to win all of their upcoming games against the upcoming run of poorer NBA teams to get back into the playoff hunt. Unfortunately on Friday, they regressed in problem areas you’d think they had already conquered. The Rockets gave up 48.1% shooting to a Bucks team that was averaging as a team 40.4% for the season. The Bucks also scored a whopping 56 points in the paint, thanks to Andrew Bogut going off for 24 points, as well as 22 rebounds, 7 of them on the offensive glass. The Rockets had no one who could match his size, or could counteract his shot blocking ability (5 blocks). One of the apt microcosms of the defensive struggles the Rockets went through the entire game was when Luis Scola stupidly made contact with Ersan Ilyasova on a 3-pointer, sending him to the line with 35 seconds remaining and a 90-85 lead. Ilyasova made all 3 free throws, giving them a seemingly insurmountable 8-point advantage. But Kyle Lowry followed up that mistake by hitting two consecutive 3-pointers in a row sandwiched around a Brandon Jennings free throw, cutting the lead down to 94-91 with 21 seconds remaining. Brad Miller would miss a 3-pointer with 13 seconds remaining that could have brought them to within one point. If only Scola hadn’t committed that dumb foul, there could have been a different outcome. But it’s bad defense like that which gave the Bucks the opening that was provided to them to seize the win. Throw-in surprisingly bad shooting by Kyle Lowry (4-of-15 for 11 points), Kevin Martin (5-of-13 for 23 points), Luis Scola (4-of-13 for 10 points), and Shane Battier (2-of-8 for 4 points), the Rockets had no chance. Especially given they were out-rebounded 48-37. It’s funny how when the team does well with guys like Kyle Lowry stepping up, people start thinking the Rockets don’t need Aaron Brooks after all. Well, we saw how important it is to have Brooks’ scoring, kind of like what we saw last year where there was talk that the team didn’t really need Yao when they were winning, only to run out of gas and put that nonsense talk to rest. The only bright spots for Houston was the bench. Jermaine Taylor actually got decent minutes and delivered like I always knew he would, scoring 10 points on 4-of-5 shooting in 17 minutes. He also had two steals. Finally it looks like Taylor’s athleticism and production is too good to ignore. Similarly, Courtney Lee scored 16 points on 7-of-10 shooting, and Jordan Hill hit 4-of-7 shots for 8 points. Frankly speaking, the Rockets’ psyche has got to be shaken after such a dud of a performance in a game that had “W” written all over it beforehand. They won’t have much time to sulk about it since they play another mediocre team, Cleveland, in the second game of a back-to-back. The Cavs are 7-15 in the East, having lost 6 in a row, with 5 of those losses coming from losing margins of 19 (vs. Boston), 28 (vs. Miami), 34 (vs. Minnesota), 10 (vs. Detroit), and 20 (vs. Philadelphia). The saving grace for the Rockets seem to be that they play much better at home where they have won their last 4 games, which is the way it should be. Remember a few seasons ago when they played better on the road than at home? The game against the Bucks in Milwaukee was such a joke, I won’t even bother getting into many details other than to say the Rockets were outplayed again by a sub-.500 team, and played no defense as the Bucks racked up the most number of points against the Rockets this season. And they did it without their leading scorer (Michael Redd), rebounder (Andrew Bogut), and assist man (Luke Ridnour). My oh my. How far we’ve come since last year’s 22-game winning streak. ABSOLUTELY PATHETIC. It’s weird how all the players know they are sucking right now, but no one is doing anything about it. in an embarrassing 124-112 loss to Milwaukee Wednesday night. After the game, Yao said, “Now is not early in the season. It’s not 20 games into the season. Now it’s 50 games into the season. We’re still stuck in here and talk about we still have time to fix it, from first game of the season and 10 games in the season and 50 games into the season. We still talk about we need to fix it.” Click here for Raymond’s full translation of the interview. McGrady: “We can sit here and pretty much talk about what we talked about a couple days ago after the game — defense. We don’t know how to play. We don’t execute defensively. We’re just right now a team that doesn’t know how to play defense. The first quarter, second quarter, third quarter — they got whatever they wanted. You’re not going to win that way. Ironic that he would say there is no ball movement. To me, the players shoulder a big responsibility, but the coach must receive a big part of the blame, too. Yao Ming and Yi Jianlian battle for position Saturday night in a much anticipated match-up. The game didn’t turn out as expected, with Yao and Yi both struggling from the field. Click here for more photos from the game. 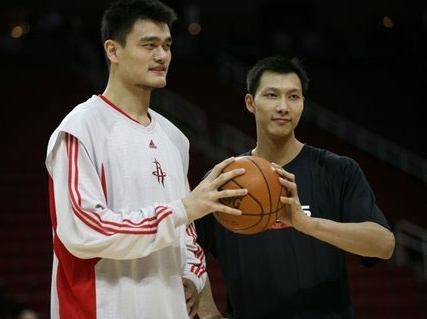 Click here for pre-game photos of Yao and Yi. Click here for photos of fans while watching the game. Although the Rockets beat Milwaukee 91-83 Saturday night, the much anticipated rematch of Yao vs. Yi turned out to be a dud. Yao had a below average game, getting outplayed by another #1 draft pick, Andrew Bogut. Bogut looked like the All-Star, scoring 20 points on 10-of-20 shooting, most of them made over Yao. I wonder if the Australian continent tuned in for this one? Yao only scored 12 points on 5-of-11 shooting, was shockingly only 2-of-5 from the free throw line, but did rack up 3 blocks. He had his moments in the fourth quarter as the Rockets finally pulled away after the Bucks had taken a 69-68 lead early in the quarter. He had a huge dunk with 8:02 remaining to make it 72-69, and also had a block with 1:25 remaining to keep the Bucks from making a late charge. Yao throws one down over Milwaukee’s Brian Skinner on a play where he flopped a few seconds earlier in an attempt to draw a foul, but the refs didn’t fall for it. 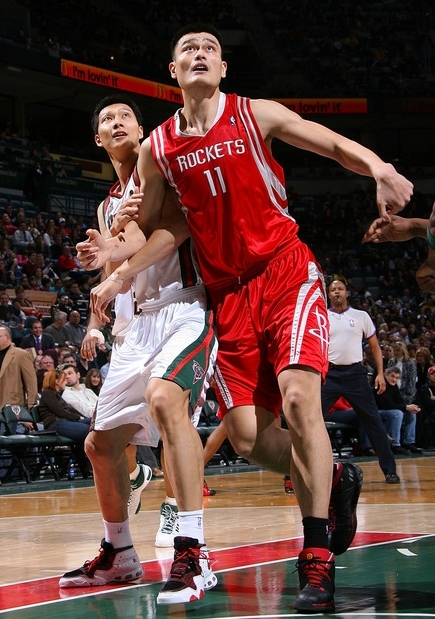 Yao finished the game with 22 points on 9-of-22 shooting, 7 rebounds, 2 assists and a block in a 107-86 victory. Click here for more photos from the game. Click here for pre-game photos. As expected, the Rockets took care of business Monday night against the poor, injury-plagued 25-43 Milwaukee Bucks to clinch a spot in the Western Conference playoffs. With Andrew Bogut, Charlie Villanueva, Dan Gadzuric, Bobby Simmons, and Mo Williams all out, the Rockets got off to a fast start with another 30+ point first quarter (33), led by 9 at halftime, extended it to 23 in the third quarter, and cruised to a 106-87 win. Although the Rockets were playing the second game of a back-to-back and they were embarrassed (once again) the night before by the Hornets, it was impossible to fathom the idea the Rockets would lose this game. If they had lost, they would have serious problems at this stage of the season losing a game like this one. Also, starting since March 9th when he started wearing the splint, he has shot 67-of-79 (84.8%) from the free throw line, which is very close to his season average of 85.8%. It’s only his last two games where he has struggled from the field, making only 16-of-44 shots for 36% shooting. If I could ask Yao one question, it would be about the effect the splint was having on his shot. He mentioned after the Hornets game the problem was that he wasn’t able to get position down low, and he vowed to get better position against the Bucks. However, getting better position still didn’t help as he started the game 0-for-5. It was interesting that Jeff Van Gundy left Yao in the game until the very end of the game when it was well in hand, probably so he could improve his conditioning and work the kinks out of his suddenly-gone-south shot. Yao drives the baseline on Milwaukee’s Andrew Bogut Tuesday night in Milwaukee. Yao won the battle between the two former #1 draft picks, scoring 23 points and grabbing 7 boards, compared to Bogut’s 7 points and 3 rebounds. But for Yao, it was still an “off” night, making only 10 out of 24 shots. Still, the Rockets escaped with a 97-93 win to complete their road trip. Click here for the game story. For more photos from the game, click here. Okay, I’m finally getting back on schedule. I have been traveling the past 4 days and it has been hard for me to watch Yao and the Rockets play “live” and provide timely analysis. As a patchwork solution, I have been using a Slingbox to watch the games from my DirecTV Tivo late at night from a hotel room, or from a free wi-fi hot spot. Obviously, the Slingbox isn’t as good as watching on a TV because the picture is grainy, especially when the players are moving fast. Because it’s difficult to see what actually happened with the grainy picture, I have to constantly ‘rewind’ to see a play over again. And when you’re doing that on a Slingbox, it takes about three times as long to get it to the right place in the recording because of the delay involved. It’s even worse when you’re watching it over a Windows Mobile phone, which I had to do last night because I couldn’t find a wi-fi hotspot. It was a weird night for Yao Ming last night in Milwaukee. Once again, he got in foul trouble, a problem we thought he had finally conquered last season. He picked up his third foul late in the second quarter, and because he was playing limited action, he was held to only 6 points in the first half. Luckily, Dikembe Mutombo did a great job subbing for him. Deke grabbed 8 rebounds and scored 8 points in ten minutes of work in the first half alone! The Rockets led 48-39 at halftime, thanks also to great team shooting (47%), three-point shooting (5-of-7), and 26 rebounds, which led to 10 second-chance points and 15 points from the bench. 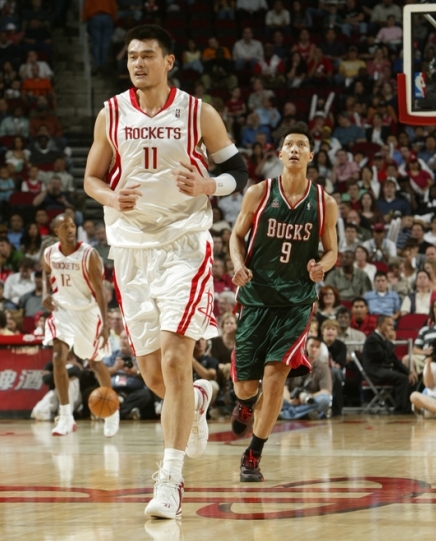 Then Yao came out in the third quarter on fire, seemingly determined to put the Bucks away. In the first six minutes of the second half, he made 6 of his first 7 shots and scored 12 points. Meanwhile, Milwaukee struggled in their shooting and when the Rockets opened a 17-point lead, a chorus of boos rained from the rafters. The Rockets continued to impress with a run-and-gun offense in the third quarter, opening up a 73-50 lead at one point and hitting 65% of their shots in the third. I was impressed — and surprised — the Rockets could play so well at the end of a long road trip, along with it being their fourth time in five nights. But just when I started to think the Rockets were going to slide out of Milwaukee with an easy win, the wheels fell off. As solid as he was in the third quarter, Yao completely lost his shooting touch. The Rockets went to him early in the fourth quarter to try to put the Bucks away, but Yao hit a cold spell and missed 7 of his last 9 shots. I don’t know if fatigue finally hit him or what, but often when Yao gets a hot shooting hand, he tends to cool off dramatically. I think it has a lot to do with confidence. Once he’s on a roll, he’s tough to stop. But once he starts missing jump shots, I think it can get into his head a little bit. That dry spell let the Bucks back into the game. Fortunately, Rafer Alston came up with some big shots, hitting a jumper from the top of the key, and a three-pointer a few minutes later to stop some of the bleeding. But the Bucks’ Michael Redd and Charlie Bell continued to pour in points, and the Rockets missed 7 of their last 8 shots in the game’s final four minutes. As a result, the Rockets’ once insurmountable lead was whittled down to 5 points with just a few minutes remaining. T-Mac came to the rescue, though, making 4 free throws in the waning moments of the game to fend off the pesky Bucks, sealing a 97-93 win that almost slipped away – a typical game that the Rockets frequently lost last season. Overall, it was probably McGrady’s best game this season when he has been struggling so much since the season began. T-Mac finished with 32 points on 11-of-19 shooting, hit 3-of-5 three-pointers, and had 6 boards, 5 assists, and 3 blocks. Fantasy Leaguers who have T-Mac on their team can finally breathe a sigh of relief that he’s back on track. Now the Rockets have a respectable 3-2 record and come back for some home. Based on the only game they have played at Toyota Center this season when they destroyed Dallas, the Rockets may have a much better chance of creating a true home court advantage. The Rocket Rowdies with their constant screaming may have made a huge difference. We’ll find out soon enough starting Friday night against the Knicks. Oh yeah, speaking of Dallas, have you noticed they are now 0-4? Wow, how fleeting can good times be? Enjoy them while you can, I guess. Yao throws down a thunderous dunk against Milwaukee at Toyota Center Wednesday night. Scoring 21 points and grabbing 13 boards, Yao was the difference in an 86-84 victory. To see more photos from the game, click here. WEDNESDAY, 2/1/06 – Okay, this is more like it. It wasn’t perfect, but the Rockets reminded everyone what they can do when they have their “Big Two” of Yao and T-Mac together. 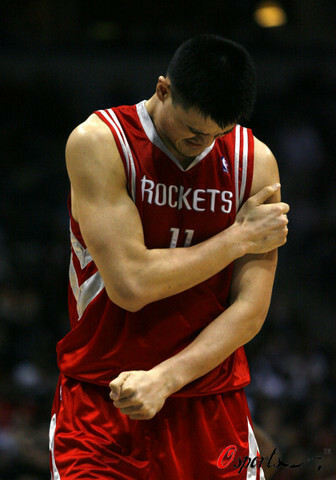 Yao showed just how much the Rockets missed his presence during those 21 games he was out of action. On a night when T-Mac didn’t have that great of a game (6-of-19 for 22 points) based on his very high standards, Yao delivered big-time in only his second game back from toe surgery, scoring 21 points (8-of-18 shooting) and grabbing 13 boards to pace the Rockets to an 86-84 victory over Milwaukee. Before I go further, let’s throw out the fourth quarter where the Rockets only scored 9 points. I’ll talk about that in a minute. At the start of the second quarter, Chuck Hayes checked in and ignited Houston’s sluggish offense. In his first 3 minutes, he grabbed four rebounds, tipped in a garbage basket, blocked a shot and then hustled down court immediately after the block and was rewarded with an alley-oop, fast break pass from Rafer Alston for a beautiful bucket. Hayes’ impact on the Rockets has been nothing short of remarkable. Before signing with the Rockets two weeks ago, he was in Albuquerque with their NBDL team. Hayes started showing glimpses of what he can do on the big stage on January 20th. In only his second NBA game, he scored 12 points and grabbed 13 boards against Chicago. Hayes impact on this game was completely obvious. Beyond grabbing 8 boards and scoring 8 points in just 13 minutes, he jump-started the Rockets’ tempo both on offense and defense, and just as important, the Toyota Center crowd’s enthusiasm level. Yao checked back into the game shortly thereafter, and it was vintage Yao. He hit fallaway jumpers, grabbed rebounds, and dished a sweet dish over a defender’s head to Ryan Bowen for a layup to cap a 13-2 run that cut their deficit to 29-26. When Hayes scored on a nifty baseline reverse layup, Houston took the lead for good, 30-29. A little over a minute later, Yao made his patented spin move on the baseline around rookie Andrew Bogut and threw down a vicious two-handed dunk, with a little roar and snare to go with it! Man, we’ve missed that, Yao. Welcome back. Having you in the lineup makes such a difference. Not a knock against any of your teammates, but you just add another dimension to the offense that Juwan Howard and Dikembe Mutombo cannot offer. He wasn’t done, though. Thirty-two seconds later, he hit a fallaway jumper to make it 35-30. Less than a minute later, he backed down his defender on the block. Unlike other occasions where defenders would ‘pull the chair’ from behind Yao to make him lose his balance and force him to throw up a wild shot as he fell to the floor, it looked like this time Yao saw that he had an open lane to the basket without needing to bother making a spin move, or fadeaway jumper. Instead, he just backed up, looked up behind him, saw the basket, and as he was falling to the floor, laid it in without ever needing to turn toward the basket! Only someone 7’6” with good touch could try scoring on a play like that one! That unlikely basket made the score 37-30. Chuck Hayes’ energy and Yao’s 11 points on 5-of-8 shooting in the second quarter was pivotal to giving Houston an unusual 49-41 lead at halftime. The Rockets maintained a double-digit lead most of the third quarter, thanks to T-Mac getting back on track offensively after only making 1-of-6 shots in the first half. McGrady scored 13 points on 4-of-7 shooting in the third to provide Yao some relief and to create that “one-two” punch the Rockets have been waiting for most of this season. But Yao didn’t disappear. He made 3-of-4 shots in the third quarter to score 6. Heading into the fourth quarter, the Rockets led 77-66. The question was if Houston could muster some killer instinct and cruise to an easy victory. That final quarter was ugly, and represented the problem they have had all season: the inability to score. Yao missed all three of his shots (maybe blame it on fatigue from his 21-game absence), and T-Mac went 1-for-6 again (maybe because his back wasn’t feeling great). Rafer Alston was 1-of-4, but he hit a big runner in the lane with 2:45 remaining to make it 86-81. On the ensuing possession, Jamaal Magliore had a sure-fire dunk that could have made it 86-83, but Yao came up with a HUGE defensive play by blocking Magliore’s shot at the rim. Man, I’ve missed that too, Yao. The rest of the way, both teams missed lots of shots. Houston’s defense clamped down and forced the Bucks to miss 14-of-21 shots in the fourth quarter, including a missed three-pointer by Bobby Simmons with a few seconds remaining that could have won it. Finally the Rockets’ bad luck of losing games every possible way has ended, at least for now. Couple Simmons’ missed shot with the fact that Milwaukee’s leading scorer, Michael Redd, was out because of back spasms, and the Rockets only need about 13 games like this one to even out their bad luck this season along with their shocking 16-29 record. MONDAY, 1/23/06 – Three games after coming off the injured list, Tracy McGrady continues to play off-the-hook, scoring 41 points Monday night in Milwaukee after scoring 43 the previous night in Detroit. He took over in the fourth quarter against the Bucks by scoring 14 points in a row to lead the Rockets to their largest margin of victory, 97-80, since…I can’t even remember when. T-Mac’s numbers weren’t Kobe-like, but still very impressive and entertaining nonetheless. He made over 50% of his shots (17-of-32), made 3 three-pointers and racked up 8 rebounds. David Wesley also had a good game, hitting 6-of-11 shots (3 treys) for 17 points. And rookie Chuck Hayes continues to rebound well, grabbing 12 boards and scoring 7 points. Lonny Baxter also helped out on the boards, grabbing 11 rebounds. Unfortunately, a day after missing a three-pointer against the Pistons that could have won it, Luther Head had an awful game, missing all six of his shots (all 3-pointers). But it didn’t matter with T-Mac taking on the scoring load. It’s interesting that Jeff Van Gundy has decided to just let T-Mac take over in most games, with the hope that young guys like Rafer Alston (11 points) and Head will develop offensively, and as a stop-gap until Yao gets back into action. It’s also neat to see players like Kobe and T-Mac be given the green light to score for their offensively-challenged teams. It reminds me of the 1970’s and 80’s when scoring machines like George Gervin and David Thompson would put up huge numbers on a nightly basis. As long as the Rockets stay competitive like they have been the last three games (two of which they have won), I just say…let it roll, T-Mac, let it roll. You are currently browsing the archives for the vs. Milwaukee category.